The Jabra Elite 65t is a perfect balance of usability, features, and sound quality. These headphones offer a reliable connection and are a pleasure to use day-to-day. Their long battery life means you won’t be fishing for the charging case as often as the competition. While we had some niggles about design and fit, the Jabra Elite 65t do so much right that we can forgive its minor issues. If you want a pair of high quality truly wireless earbuds that aren’t the Apple AirPods, then the Jabra Elite 65t should be at the top of your list. 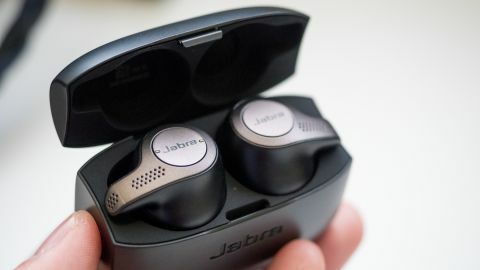 After spending over a month with them, we came away impressed with the well-rounded package that Jabra managed to create: The earbuds offer a subtle, mature look and a reliable wireless connection, which isn’t always the case with truly wireless earbuds. Plus, they sound great compared to the competition. Coming in at $170 (£150, AU$300), the Jabra Elite 65t offer a mature design, excellent battery life, balanced sound, and most importantly, reliability. They’re not cheap, but when viewed as a complete package, we think they’re worth every penny. The Jabra Elite 65t aren’t going to win any design contests, sure, but we liked the understated and mature look. The earbuds and charging case are made entirely out of plastic but the headphones still manage to feel like a premium product. The earbuds themselves feature a nice soft touch plastic that makes them feel comfortable even during extended periods. There are perforations in the earbuds which allow the various mics to pick up your voice for calls but also to allow outside sound to be mixed with your music. Better, you can customize how much sound to let in via Jabra’s app, which is available on Android and iOS. Speaking of, the app works well and lets you customize different presets for situations like commuting, relaxing, and others - though, one quirk on Android is that you’ll have to download a separate Jabra Service app in order to use the main Jabra Sound+ app. If you're wondering how to control the music, each earbud houses a different set of controls. The left earbud features a rocker for adjusting volume and a long press allows you to skip or go to a previous track. The right earbud houses a single button that can play/pause music, answer call, and activate your voice assistant with a long press. It also doubles as a power button with a long press. To charge the headphones, all you'll need to do is put them back in the charging case, which is quite compact and is about the same size as the Apple AirPods case. It features a microUSB charging port (which is annoying as most laptops and phones today use USB-C) and is, strangely, a bit slippery to hold. Opening the case, you’ll find that the lid isn’t magnetic nor is it spring loaded - this makes the case a bit cumbersome to fiddle with and cheap feeling. The earbuds themselves are also not magnetic so you’ll have to make sure you orient them correctly before closing the lid. We hope Jabra makes the earbuds and case magnetic in future versions to make inserting the earbuds in the case easier. Using the Jabra Elite 65t is a pleasure. The earbuds automatically turn on when removed from the case, which not all truly wireless earbuds do. The earbuds also turn themselves off when placed back in the charging case - a huge benefit for folks who forget to turn off electronics when they're done using them. Wireless performance is excellent. The headphones connected to our phone immediately and rarely stuttered. You can use one earbud at a time, though note that the right earbud acts as the master so use it when you want to take calls with a single earbud. And when you’re ready to go back to a stereo listening experience, taking the left earbud out of the charging case connects the two immediately. Sound quality, similarly, is excellent - it's balanced with as slightly warm tilt. This means bass has good impact and extension. Highs are rolled off so music never sounds harsh and while there’s still a good amount of detail in the highs, the 65t lacks the sparkle and resolution of earphones like the RHA T20i. For commuters, there are even more benefits. First off, they block out tons of external noise = but, should you need it, you have the option via the app to let the external mics pump some outside audio to keep you aware of your surroundings. In terms of battery life, the Jabra Elite 65t are rated to last 5 hours on a charge but we managed to exceed 5 hours a few times when listening to music at low to medium volume. That said, if 5 hours isn't enough time, the charging case is good for an additional two charges to give a combined 15 hours of listening. Charging the case is very fast, even without the help of USB-C.
All things considered, the Jabra Elite 65t are one of the best truly wireless headphones you can buy today. They cost slightly more than the Apple Earpods but they also offer better sound quality, noise isolation and adjustable ambient noise when you want it. And if you don’t like the design of the odd, alien-looking AirPods, the mature, understated look of the 65t may be to your liking. While the Jabra Elite 65t are easily one of the highest scoring true wireless headphones we've reviewed, there are a few others on the market worth considering: If you want a pair of exercise earbuds, there’s the Jabra Elite Sport which has a higher water resistance and handy sports-oriented features. For audiophiles who don’t mind stretching the budget, the active noise cancelling Sony WF-1000X are an excellent choice. Bassheads will want to try the SOL Republic Amps Air.